After pushing through the psychologically important $1,300 an ounce mark last week, gold prices fell sharply today (Monday). In morning trading, gold prices today were down more than 1.7%. 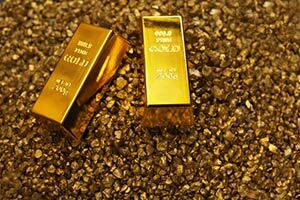 But Money Morning Resource Investing Specialist Peter Krauth said today's decline is just a short-term problem, and he remains bullish on the gold price moving forward. Gold prices fell $22, or 1.71%, to $1,266.70 an ounce in U.S. trading Monday morning. After last week's rally for the gold price, it appears many investors are taking profits today. The U.S. dollar index is also higher today, sending the price of gold lower. Higher crude oil prices sparked a rally in stocks worldwide and took some of the shine off the precious metal. Crude oil prices spiked more than 2% early Monday to $45.50 a barrel. Worries over the massive fire in Alberta, Canada, has boosted oil prices. More than 400,000 acres in the oil patch, equivalent to about half the size of Rhode Island, are burning. A big shakeup in the Saudi Arabian government over the weekend also has oil markets on edge. The oil-rich nation fired its long-serving oil minister. OPEC meets in early June to discuss production cuts. Meanwhile, The Wall Street Journal Dollar Index, a measure of the value of the U.S. dollar relative to 16 foreign currencies, rose a solid 0.49% Monday. Since gold is priced in dollars, the metal becomes more expensive to foreign buyers when the dollar rises. So a strong dollar is bearish for gold prices. So far in 2016, gold prices have rallied on a softer U.S. dollar. The index is off 4.3% year to date. But it's not just a weak dollar that has stoked interest in gold. Historically, gold tends to outperform when a good chunk of the world is debasing its currencies. That is the case today. The European Union, Denmark, Norway, Sweden, Switzerland, and Japan are all experimenting with negative interest rates. The aim is to spur growth by allowing currencies to decline. So far, results have been mixed. There are widespread reports that many people are hoarding cash in these regions. Others are buying gold. The U.S. Federal Reserve's low interest rate stance has also benefited gold prices this year. After hiking interest rates for the first time in nearly a decade in December, the Fed has held interest rates steady at a range between 0.25% and 0.50%. Fed officials still point to two more interest rate hikes this year. However, financial markets are pricing in just one hike, and that's not until the end of the year. Probability of a hike at the June meeting fell to just 8% after Friday's weak jobs report. Odds for an interest rate increase in September are 35.1%. By December, the odds of a rate hike hit 52.6%. Last week, Krauth warned that a rally in the U.S. dollar could result in a minor setback for gold prices. That's exactly what we saw today. He also said recent hawkish comments from U.S. policymakers suggest a June rate hike is not totally off the table. Still, Krauth remains bullish on gold prices in 2016. The price of gold is up more than 20% so far this year and is poised for more gains. The ineffectiveness of global central banks and worries of an economic slowdown overseas are two factors that will keep investors buying gold. A possible June "Brexit," a United Kingdom withdrawal from the European Union, is another catalyst for gold prices this year. Krauth believes the positive momentum in the gold price is here to stay in 2016. He sees more upside in the gold price, yet adds there will be price volatility along the way.